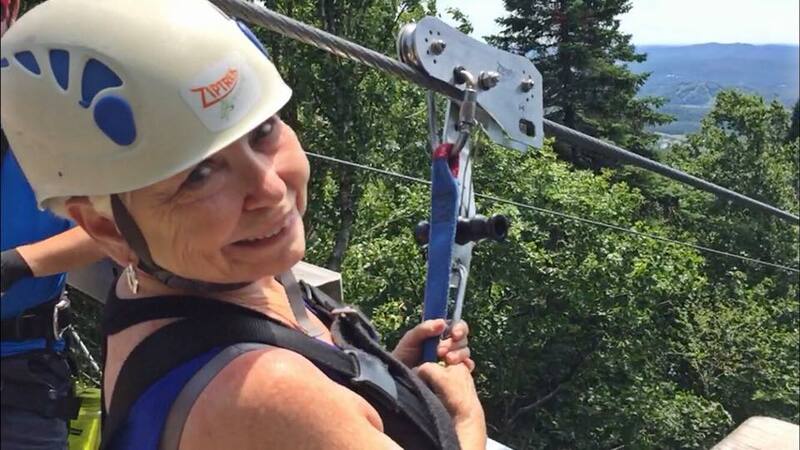 Some adventure tours claim to be for all ages and it’s really not true but we put Ziptrek Ecotours Tremblant to the test. We covered ages 7 to 77 and everyone had the time of their lives. 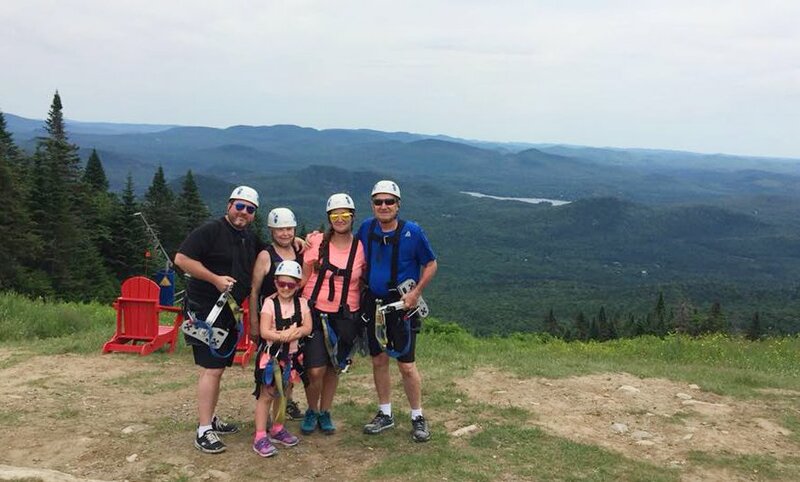 Ziptrek Ecotours Tremblant is an awe inspiring journey that allows you to zip from the summit of Mont Tremblant back to the village. 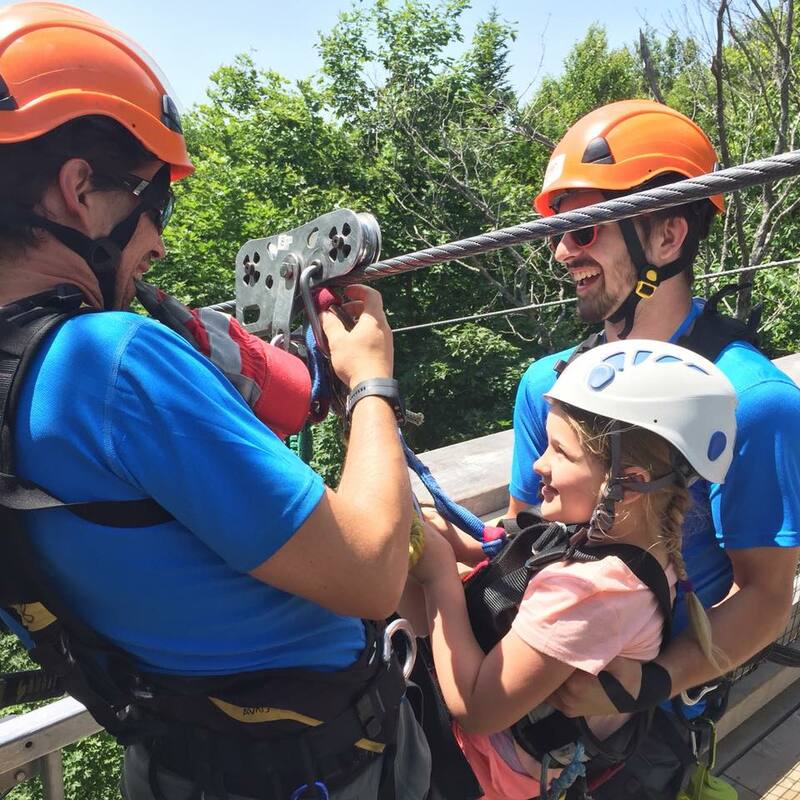 Featuring five distinct ziplines that total almost 4 km in length, Ziptrek Ecotours Tremblant is our favorite summer family adventure in Mont Tremblant. 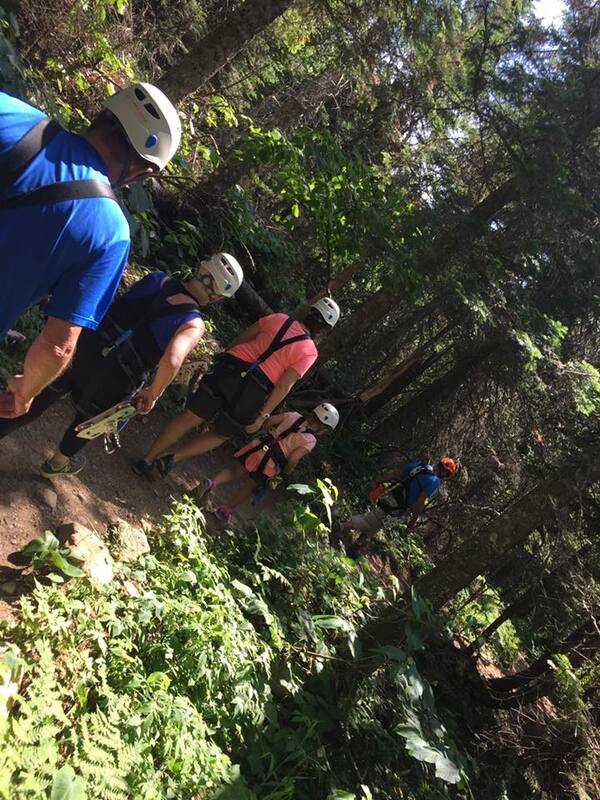 Come along for the journey and see what makes Ziptrek Ecotours Tremblant so spectacular. 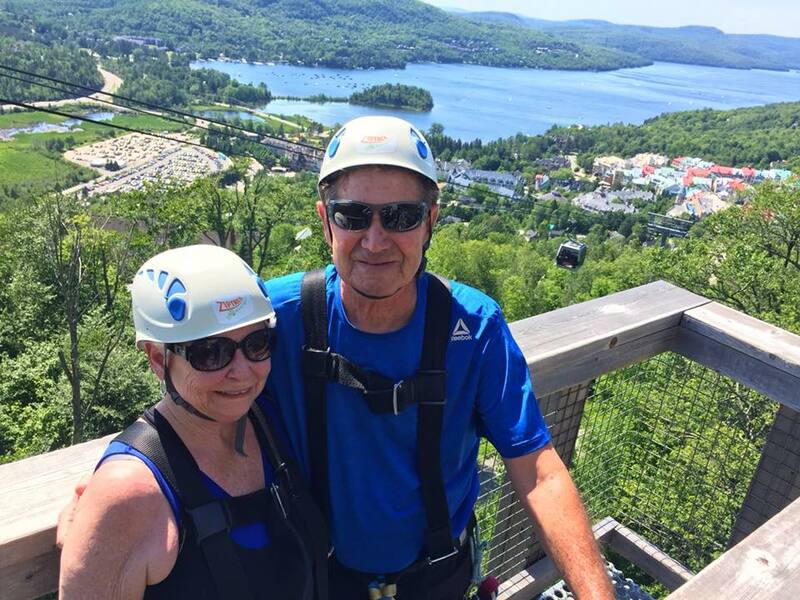 For more great Mont Tremblant adventures like Ziptrek Ecotours, check out our Mont Tremblant Summer Bucket List. In our group, Athena was the youngest guest. She could ride some of the lines herself but because of her size and weight, she needed to ride some of the lines with a guide. We were happy that she could still participate even though she didn’t meet the minimum weight. On the other end of the age spectrum, Cord’s parents, Carol and Jerry, are in their late seventies. The tour is three hours and I worried that hiking on the mountain would be too much for them. I spoke at length with one of the guides before booking our excursion and I felt confident that given enough time, they would be fine. So, off we went. The tour began at the Guest Services desk located in the Adventure Center in the Sommet des Neiges building. We met our guides, put on our harnesses, and stored our stuff in a secure bin. From the moment we walked in the door, I could tell the level of service we were going to receive from the guides. They were happy and excited to greet us. The positive energy was contagious. We arrived at the summit of Mont Tremblant via the Panoramic Gondola ride. The weather was ideal and the views were spectacular. We could see for miles and the lush greenery was all around us. It’s worth it to visit Mont Tremblant just for that view. 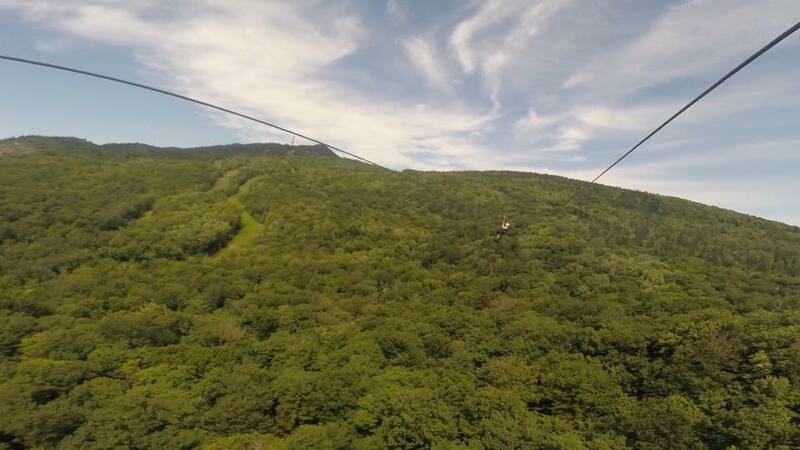 It was only a short walk to our first zipline. 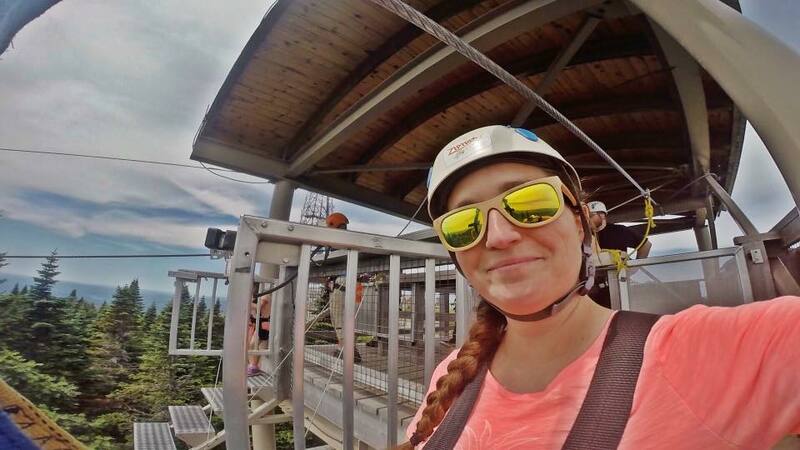 I’ve experienced lot of ziplines before but every one is different. This course required you to walk down three steps until the slack in your harness was tight. There was no rail to hold on to, making it just three steps to seemingly nowhere. It was a little more intense than I anticipated and the first line was so long that I couldn’t see the platform on the other side. Athena could do the first zip on her own. When they said “go”, she jumped off the step and she was gone. Just like that, without hesitation or fear, she smiled as she flew through the sky. Her courage is remarkable. I don’t remember being so fearless at her age. We arrived on the second platform and watched the rest of our group zip in two by two. At first, they appeared like little mosquitoes in the distance, growing quickly as they got closer. I watched in awe as Carol held on to her first line and zipped closer with a huge smile on her face. It was the first time her and Jerry had been zipling and they showed as little fear as Athena. One of the greatest gifts I receive in life is watching others push the limits of their comfort zone because of something I planned for us. It makes me feel accomplished and fulfilled. Because of the unique harness system, we were given the option to zip upside down. 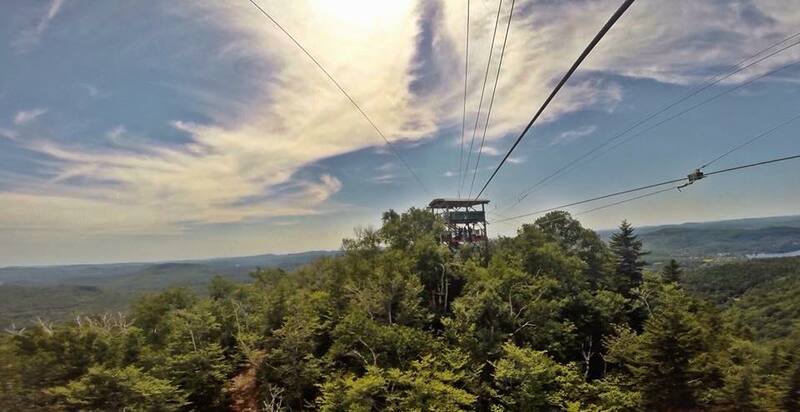 I didn’t try it on the first zipline but I was ready when I reached the platform of the second zip. I swung my legs up over the line and let my body and arms relax as I watched the trees go by below me or above me or I’m not quite sure which was was up. It was so freeing to have my arms open wide upside down. It was already a rush but the upside down element added the adrenaline aspect that I was seeking. The educational component provides a unique insight into the surrounding environment on both a local and global scale. On each platform, and during the hiking, the guides shared knowledge about the mountain and the environment. We really appreciated the distraction during the hiking sections. One of the hikes to a platform lasted about 30 minutes. The hiking was an added intensity that Carol feared more than the zips. As we weaved our way along a path on the mountain, the guides closely monitored our pace and breathing to make sure no one was struggling too much. Rather than pointing it out when Carol was tired and slowing, they took a short break to explain more of the ecosystem and environment to us. They made it seem like it was part of the tour, taking any time pressure off of Carol. It made us all feel respected and nurtured. It was obvious that they had been doing their job well for years. 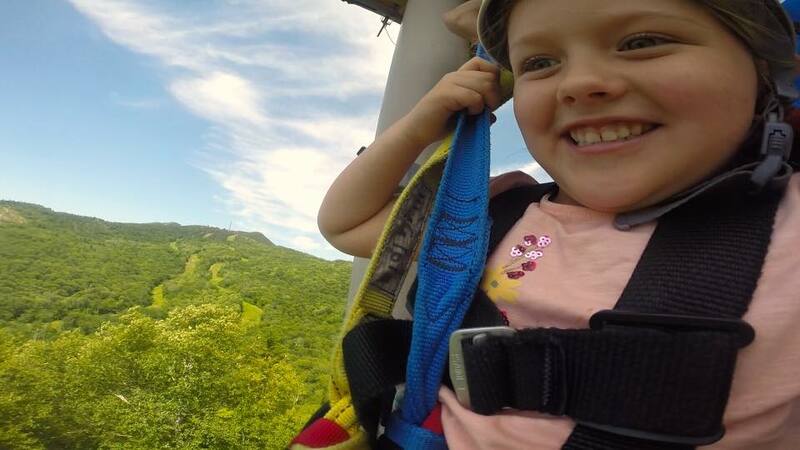 Similarly, the guides made Athena feel special when she was too small to ride a line on her own. They playfully fought over who was going to take Athena and they both helped attach her to ride tandem. Not once did she feel left out or like an annoyance. Even when they reached the other platform, before I arrived, they asked her if she wanted to be their helper. She became the official “Water Girl”, giving water to guests when they reached the platform. She was bursting with pride when I arrived and she asked if I wanted some water. She poured water into a paper cup and handed it to me with a never-ending smile. 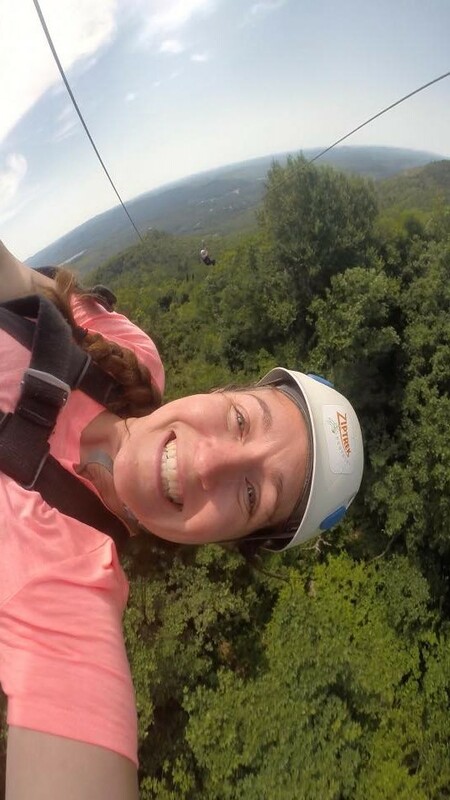 If ziplining with Ziptrek Ecotours is on your Mont Tremblant bucket list, use promo code PRERESERVEZ15 for a 15% discount on your adventure. From start to finish, Ziptrek Ecotours was the tour for us. It pushed our limits in a safe environment and provided three hours of adventure for the whole family.